Unity of Massillon in Massillon, Ohio, serves the greater Canton-Massillon area in scenic northeastern Ohio. The ministry began as a study group in the early 1900’s meeting in members homes and rented spaces in the Canton, Ohio area. In 1931 we incorporated as the Unity Society under Rev. Jessie Gardner Maloney. In November of 1954 we changed our name to Unity Church of Truth. A prayer line was established in 1971. In 1976, we moved to our present location at 4016 Wales Avenue NW, Massillon, Ohio. 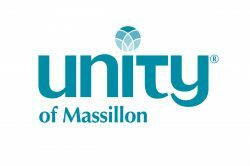 Again our name was changed in 2016 to Unity of Massillon. Our present church is located on six acres of beautiful, wooded land in Jackson Township, a prosperous fast-growing suburban area. We are a friendly and warm congregation with an average of attendance of 20+ (with a capacity for 85). In 2011, we installed a chair lift, so members of our community with mobility challenges may now enter directly from the side parking lot into the lower level door and take a ride up the stairs to the sanctuary. We have been blessed with a number of excellent speakers who have, and are continuing, to come in and deliver their messages to us, each with their own insight into Unity and spirituality. We are blessed with a vibrant, talented concert pianist on a grand piano. Vocal accompaniment is uplifting and outstanding. With spirit-filled leadership, we desire to grow to be a vital spiritual and educational center in our area. Unity is non-denominational and welcomes all people. It emphasizes the divine potential within every child of God and seeks to help each person realize and express his or her divine potential for a more fulfilling and successful life. Unity teaches you how to renew your mind and how to get in touch with the indwelling Christ. Unity teaches you how to interpret the teachings of Jesus Christ in the light of modern-day experience and how to apply the principles in a practical way. Unity helps you come to understand your own uniqueness and your oneness with all of life, so you may realize and express your divine potential for a happier, fuller and more successful life. 1. God is absolute good and everywhere present. 2. We have a spark of divinity within. Our very essence is God, and we are therefore inherently good. 3. We create our experiences by the activity of our minds. Everything has its start in thought. 4. Prayer is creative thinking that heightens the connection with God-Mind, and therefore brings forth wisdom, healing, prosperity, and everything good. 5. Knowing and understanding the Laws of Life, also called TRUTH, are not enough. We must live the truth we know.